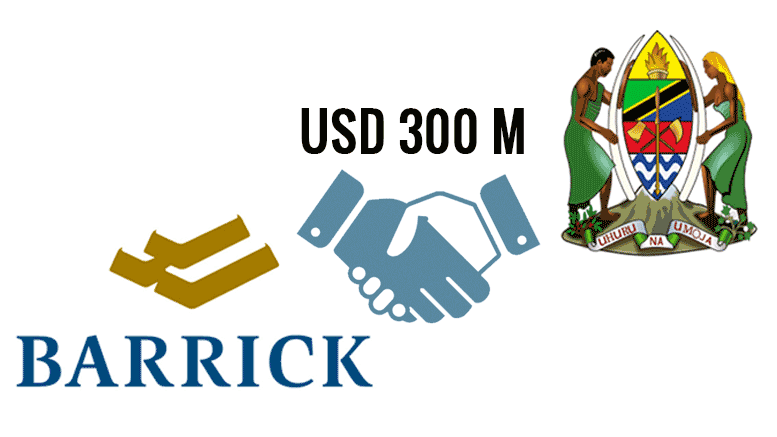 Barrick Gold Corporation (NYSE:ABX)(TSX:ABX), the main shareholder (63.9%) of Acacia Mining (LSE:ACA) (DSE:ACA) – Tanzania’s largest gold mining company – has reached an agreement with the Tanzanian government in relation to the ongoing tax dispute. A framework outlining the necessary steps for achieving this outcome was signed on 19th October 2017 in Dar es Salaam following a meeting between Barrick Executive Chairman John L. Thornton and the President of the United Republic of Tanzania, His Excellency Dr. John P. Magufuli. According to the deal, Acacia will make a payment of USD 300 million to the Government of Tanzania to assist in resolving the outstanding tax claims of USD 190 billion for Acacia allegedly under-reported amounts of gold exports. Overall, the Government’s share of economic benefits would be delivered in the form of royalties, taxes, and a 16% free carry interest in the Tanzanian operations. In addition, a new Tanzanian operating company will be created to manage Bulyanhulu, Buzwagi and North Mara mines, and all Acacia’s future operations in the country. The Government of Tanzania will participate in decisions related to operations, investment, planning, procurement, and marketing. The new company will also maximize employment of Tanzanians, build local capacity at all levels of the business, and will increase procurement of goods and services within Tanzania, Barrick explains in its press release. Barrick and the Government are also reviewing conditions for the lifting of Tanzania’s concentrate export ban. However, Acacia reminds investors in its latest press release on 20th October 2017 that it continues to seek further clarification as yet no formal proposal has been put to Acacia for consideration. Any proposal agreed in principle between Barrick and the Government will require Acacia’s approval, and Acacia will consider any agreement once it receives the full details.